The Tiny House Movement is a community of individuals and families all over the world that are opting for smaller homes and fewer possessions; seeking financial freedom and simplicity. While there is no strict definition, a Tiny Home generally refers to a home of 400 square feet or less. This could be a permanent structure, Tiny House on Wheels, or a converted vehicle – much like Gabriel and Debbie Mayes bus conversion ‘skoolie’ below! Many can’t wrap their minds around why anyone would want less living space but there really are some amazing benefits to this lifestyle or temporary housing choice. Below we are going to outline the benefits of Tiny Homes and Well-Maintained & Managed Tiny House Communities. Also, we’ll cover why now is such an important time for us to urge Shasta County to change ordinances to allow Tiny Houses as a legitimate housing option. 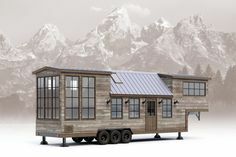 For an individual to build a Tiny House it could cost anywhere from $20,000-35,000 depending on the amount of DIY put in and the type of high-end materials used. To purchase a Tiny House, an individual could purchase one locally(within the NorCal Region) starting at around $46,000 through Liberty Cabins – which is an extremely competitive price point for the industry. Looking at both of these costs, an individual or small family could literally own a home for a small fraction of the cost of a standard home in our area. As of July 2018. according to Rent Jungle, the average rent for an apartment in Redding, CA is $896 a month. If you poured that same amount into your Tiny House, one valued at 46,000, it could be paid off in a little over 4 years! Now compare that to the the average mortgage agreement of 25 years if you were to buy a home! Tiny Houses in general require much less energy and resources. Imagine how much energy you are saving simply from heating & cooling a 150-350 sqf home rather then a 1200+ sqf home! Beyond that, composting toilets are a common thing among Tiny Homes which uses no water and does not have to be hooked up to the sewage system. And dont get me started on our NEED to conserve water in our Northern California region – so important. This has always been a drawing point for many in the Tiny House Movement – a Tiny Home allows you to find roots or exercise your wanderlust spirit! …but lets get down to some REAL LIFE BENEFITS of #3. Because of the disaster that has recently plagued us, the #carrfire, it has become even more of an appeal to me to have a Tiny House Community of Mobile Structures. If a fire is blazing in our directions, we can send out a call for trucks (if we all don’t have our own!) to get the Tiny Houses out of the line of fire – literally! Because of our region being desperately threatened by fire, should it not be our right to choose to have a mobile structure? Especially if fire insurance isn’t even an option for many of our residence in the Northern California area? Once again imagine just how much less energy YOU are exerting cleaning a 150-350 sq. ft. home as opposed to a 1200+ sq. ft. home! I think we are all going to agree that cleaning the smaller home sounds like a better deal! Now beyond cleaning, what about having to repaint the exterior of the home? Thats WAY less surface area that needs to be covers, therefore WAY less money that needs to be spent on materials! This can apply to many, many other areas of home maintenance. Before I go on, let me explain what the Carr Fire is to anyone who does not know! The Carr Fire started July 23rd on Hwy 299 in Northern California when a flat tire caused a rim-riding trailer to scrape the road, creating sparks. This devastating fire has since consumed well over 200,000 acres, 1000 homes, and 8 lives – 3 of whom were firefighters. As of today, August 17th, the Carr Fire is still going(71% Contained). All the while, many other fires are consuming other parts of our great state of California! Tiny Houses could provide temporary housing for those who lost their homes due to the Carr Fire, while they rebuild. This would allow them to continue residing on their property during the rebuild – much more convenient than living away from the property they are building on. If the local Tiny House Movement is able to band together and push for changes in ordinances…get enough donors, architects, and builders together… we could be lending these Tiny Homes to families so they can concentrate their funds on rebuilding, rather than just trying to stay afloat with a rental(which is becoming a more rare option every day)! This section is based off of the Townley Families Tiny House Community concept which would accommodate 4- 8 Long Term Residences, a Bed & Breakfast with 4-8 Tiny Houses, a Community Garden, a Community Laundry Room, and a Community Room. I bet all of my farming friends can agree, many hands make light work! Imagine eight families contributing even minimal time into maintaining a garden for the benefit of taking part in the harvest? A Community Garden has its own amazing benefits and could have its very own blog! But a few of these benefits are how gardening helps with the cost of living, promotes health with fresh produces and the physical activity, and sustains a lost art. With a community laundry room – each family does not have to take up space in a Tiny House for a washer and dryer set up. This is space saving BUT also makes sense to just have enough washer and dryers set up to accommodate eight families, rather than each having their own set. Can’t most of us sympathize with the hassle of dealing with a washer or dryer that needs repairs OR is broken beyond repair? Not only does a Community Laundry Room mitigate this problem, but the whole community is essentially pitching in to have it repaired/replaced. Coming from a Cloth Diapering Mama – this is peace of mind! This would be a larger structure where families could have gatherings that a Tiny House could not accommodate! Think about Baby Showers and Birthday Parties! But beyond that, our desire is to eventually house entrepreneurs and ‘career-volunteers’…this space can be used for large meetings, community dinners, fundraising events, and classes. Everything about this Tiny House Community would be about intentional living, knowing your neighbor, enjoying community, and ‘leaning on your village’! Life is hard but when we do it together, it’s worthwhile and so rich! This is solely based on the Townley Families Community Concept – a Bed & Breakfast would increase the sustainability of the Tiny House Community, encourage regular upkeep, increase tourism, and provide a unique asset to this area. As was outlined above, the upfront costs of building and purchasing a Tiny Home are much cheaper than building or purchasing a standard home. A tiny home pays for itself after just four years in comparison to renting in our region. In Redding, Ca and surrounding areas, we have already been dealing with the lack of affordable housing. Rentals either cost as much or more than a monthly mortgage payment, not to mention the scarcity of rentals that are even available! Fast forward to the Carr Fire – 1000+ homes are now gone, 1000+ families looking for housing… suffocating an already insufficient housing market. Due to low average income combined with housing shortage, the county must now reassess it’s housing permitting and zoning process so that the housing stock is increased without compromising safety or livability. Affordable housing is extremely important to a thriving community. Affordable housing allows families to remain a part of the community even through job loss, a family illness, or in our case, traumatic fire. Affordable housing also allows more students to see the cost of living in our area as a perk to attending our colleges. This will ensure that our schools are healthy and strong. On a more environmentally friendly note, having more housing enables individuals to live closer to their workplaces. This minimizes the need for commuting and cuts down on air pollutants and traffic. When a majority of your pay check is not going to a mortgage or a rental you’ll never own, you suddenly have anywhere from $300 – $1000+ dollars to spend elsewhere. Most of this will likely go into our local economy as individuals and families are then able to enjoy local restaurants, spend at farmers markets, and support our small, unique mom and pop businesses. Not only does this allow our local businesses to thrive, but the sales tax made by local taxes will go right back into our city! Small businesses are more likely to give back to their community and support local non-profits than our big box stores! So when we help our community save money in one area, they are able to spend it in keeping our businesses healthy, which in turns supports our very important local charities and programs. An actual graphic shared from local cafe – From the Hearth located in Redding, CA that has been offering free meals to First Responders and those who lost their home in the Carr Fire. Not only are Tiny Houses an affordable housing option but the Tiny House Movement is growing exponentially! Whether it’s because of affordability, minimalism, or its appeal to peoples’ wanderlust nature – we can’t deny the growing need and desire for this type of housing. People are consistently seeking out Tiny House-Friendly towns to move to and view these towns as progressive and forward-thinking. Shasta County has the potential to gain national exposure for recognizing these benefits and adjusting local ordinances accordingly. Tiny homes bring the possibility of home ownership to more people and with that the investment and pride of community that that entails. Also, Tiny Homes help open up a path to the American Dream for younger people that may otherwise elude them. what’s the most efficient way to inform Shasta County of our desire/need for Tiny Homes? ?